Someone very wise once told me that parenting is like having a very long rope. That as our kids grow up, we let out the rope a little bit at a time. We might have to pull it in a little bit, but we never completely let go. As the parents to an only child, J and I have held onto the rope pretty tightly, but we’re finally starting to ease up, and let go-a little bit. Luckily, she did meet a friend, and even more luckily, she LOVED skiing! We told her she had to do at least level 7 in ski school (the black diamond club) before she could learn to snowboard, because we were afraid that if she started snowboarding she’d never learn to ski. Fast forward to today, she’s in 10th grade and even though all her friends were going to the beach for spring break she wouldn’t think of not going skiing. She’s already focusing on colleges in Colorado so she can ski on the weekends. Snow skiing is the one sport we can all do together. J is a beautiful skier, since he grew up skiing up North. I started later in life, and until I was a senior in high school had only skied in Gatlinburg, TN, so I really didn’t have nearly as much experience as J did. Luckily, even though I don’t have the form or the beauty of his technique, I can hang with him. The first year we took H, we started a tradition of picking her up from ski school riding up the lift to the bunny slope to take one last ride down together. 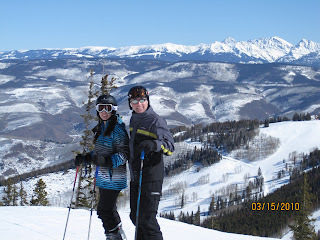 As the years went by, H became a great skier, and we were able to spend whole days on the mountain together. You couldn’t erase the smile on my face. Skiing is by far my favorite vacation. I love getting up, making breakfast, and jumping on the lift to spend entire days together. We’re physically active, outdoors in the most beautiful mountain setting, laughing and joking, and most of all spending a whole week together, just the three of us. 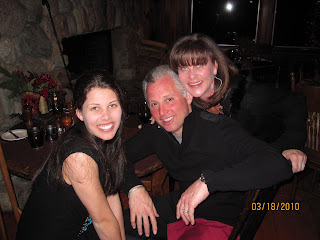 I also love the evenings…the après ski scene…bonfires, live music, and wonderful restaurants and great wine for dinner. When H “graduated” from ski school, we thought about taking a friend with us, but at that point, she didn’t have any close friends who skied at her level. None of us wanted to sacrifice time on the blue and black runs to ski with a beginner, so unless we met another family there, it was just the three of us. We’ve always felt pretty lucky that she wanted to spend that much time with her parents. At first, J would start skiing, H would follow, and I would stand there and watch for a minute or two, just happy and loving the sight of the two of them zig-zagging down the hill. Then I would take up the rear. Now, J starts, then H flies by him, and has to wait at the bottom for the two of us. She’s an amazing skier, and doesn’t have the “Oh, my God, I’m going to kill myself” feeling that we do. So it was inevitable, that she would get tired of skiing with us. It might have something to do with the cute lift operators, but this year, for the first time, she would start skiing with us, and after a few runs, ask if she could head off by herself. As J and I spent most afternoons skiing together, just the two of us, it was almost like old times. Almost…but in the back of my mind I never really relaxed, until she would let herself in the door around 4 or 4:30, red-faced and eager to talk about all the double black diamonds she’d tackled by herself, and the people she met on the lifts. 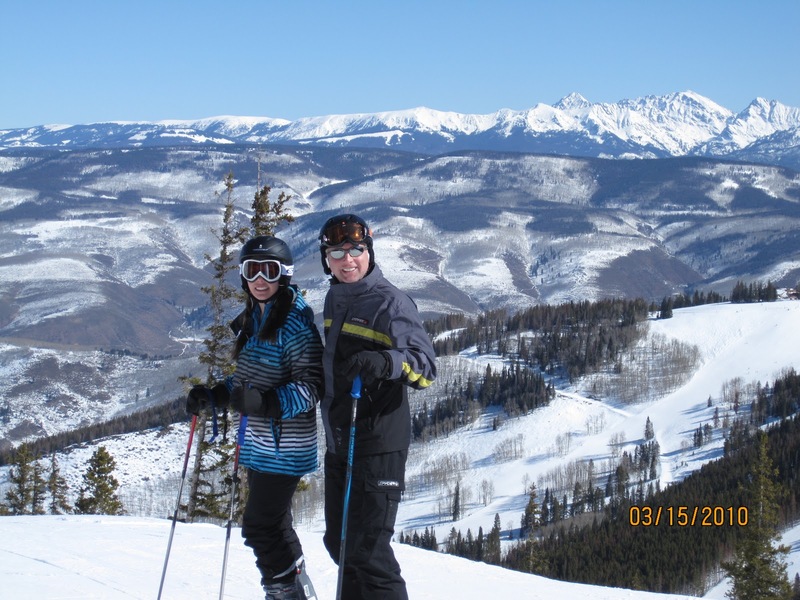 Being close to a ski mountain is one of the key goals she has at this point for where she wants to go to college. We’re letting the rope out more and more these days, and even though I know we’re pretty overprotective, I’m still anxious every minute she’s away from me. She’s driving by herself to more and more locations-school, volunteering, sporting events, social occasions, and although my life is a little bit easier now that I’m not the taxi driver I once was, anxiety now takes its place. The sweetest sound in the world is the “beep-beep” of the door opening when she comes home. Now I understand why my Mom always tells me to drive carefully, even now, at 49 years old. We can let go, but we can’t stop worrying.